Black and white old Bollywood still photo of the Hindi film, Beewee (1950) for sale. 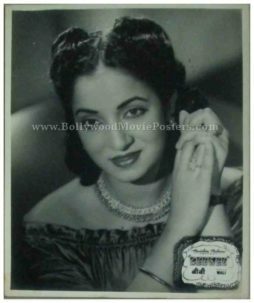 This is an actual surviving old Bollywood lobby card of the 1950 Hindi film that starred actress Mumtaz Shanti in the lead role. Featured here for sale is a rare surviving solo Bollywood movie lobby card of the film Beewee (1950). Printed and circulated during the original first release of the film (late 1940s), this old Bollywood black and white picture was printed for publicity of the film inside a cinema hall but never ended up being used.